Colocation is a popular option for many businesses who want the security and redundancy of a private data center, without the high capital investment. By placing servers in an off-site third-party data center, businesses save time and money while improving their overall IT infrastructure. Colocation providers intimately understand the needs of growing businesses which has allowed them to design and maintain the perfect data center environment. The importance of a stable, consistent IT environment has never been higher as more businesses rely on servers to store and access massive amounts of data on a daily basis. Businesses of all sizes have the opportunity leverage the elite infrastructure offered by colocation providers including multiple network carriers, fully redundant power supply, and comprehensive threat monitoring. Compared to other data center solutions, colocation is by far the most affordable and customizable. In the past, the only option businesses had was to build a data center based upon their estimated future IT requirements. This has consistently proven to be a risky strategy because businesses leave a significant amount of infrastructure under-utilized, which wastes both time and money. Colocation provides the ideal solution because businesses only have to pay for what they need, when they need it. Businesses of all sizes can take advantage of affordable, customizable solutions offered by quality colocation providers. A common problem with in-house data centers is a lack of security. 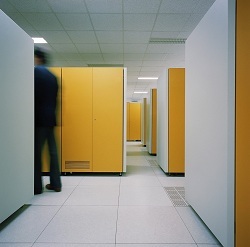 In-house data centers still do not have an effective strategy to deal with the vast amount of foot traffic which is found throughout the building. Since an in-house data center is in the same building as day-to-day employees, access is often prioritized above security. This forces all of the security measures to be confined to the data center floor rather than throughout the building. Colocation providers offer businesses a safe, security-first data center environment to minimize the risk from every known potential threat. The primary problem with other off-site hosting solutions is that businesses are forced to give up control over their equipment – if they can even use their own equipment. Colocation providers allow businesses to maintain maximum control over their equipment at all times. This guarantees businesses can still develop and maintain their own IT assets, while benefiting from housing them in a top-tier data center environment. Over the past decade, colocation providers have invested significant capital into developing a variety of value-added services to simplify and improve the entire colocation experience. The new breeds of managed services are designed to help businesses save time and money on regular server maintenance. The role of colocation continues to expand as more businesses become reliant on accessing, maintaining, and storing mission critical data. Colocation providers allow businesses to maintain maximum control over the IT environment while also providing a variety of additional benefits. Businesses can leverage the reliability, buying power, security, and infrastructure of an elite data center at a fraction of the cost of building and maintaining their own.